Policing and corruption are inseparable. 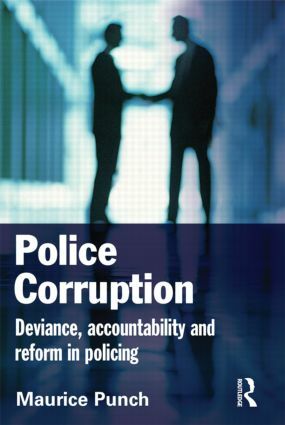 This book argues that corruption is not one thing but covers many deviant and criminal practices in policing which also shift over time. It rejects the 'bad apple' metaphor and focuses on 'bad orchards', meaning not individual but institutional failure. For in policing the organisation, work and culture foster can encourage corruption. This raises issues as to why do police break the law and, crucially, 'who controls the controllers'? Corruption is defined in a broad, multi-facetted way. It concerns abuse of authority and trust; and it takes serious form in conspiracies to break the law and to evade exposure when cops can become criminals. Attention is paid to typologies of corruption (with grass-eaters, meat-eaters, noble-cause); the forms corruption takes in diverse environments; the pathways officers take into corruption and their rationalisations; and to collusion in corruption from within and without the organization. Comparative analyses are made of corruption, scandal and reform principally in the USA, UK and the Netherlands. The work examines issues of control, accountability and the new institutions of oversight. It provides a fresh, accessible overview of this under-researched topic for students, academics, police and criminal justice officials and members of oversight agencies.